I hope everyone had an awesome Christmas, and I hope everyone got their party on for New Year’s Eve!! I know I did…..hah! I learned that in downtown Vancouver at 2am on New Year’s Eve, it may take two hours to find a cab. I learned that you may have to walk for blocks and blocks while your feet are killing you. I learned that none of that really matters as long as you had fun, dancing for hours with your friends! Now I’m taking some time to figure out what my goals are for this year, and how to make them happen. Did anyone make any big resolutions?? If you are looking for a bonus Christmas present, make sure you enter my contest for a big ol’ jar of Tropical Traditions Gold Label Coconut Oil! 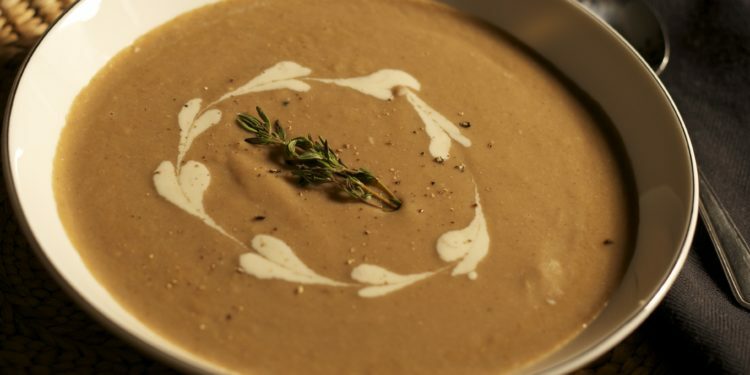 My latest recipe is for a super delicious vegan chestnut soup. I know, it sounds strange! 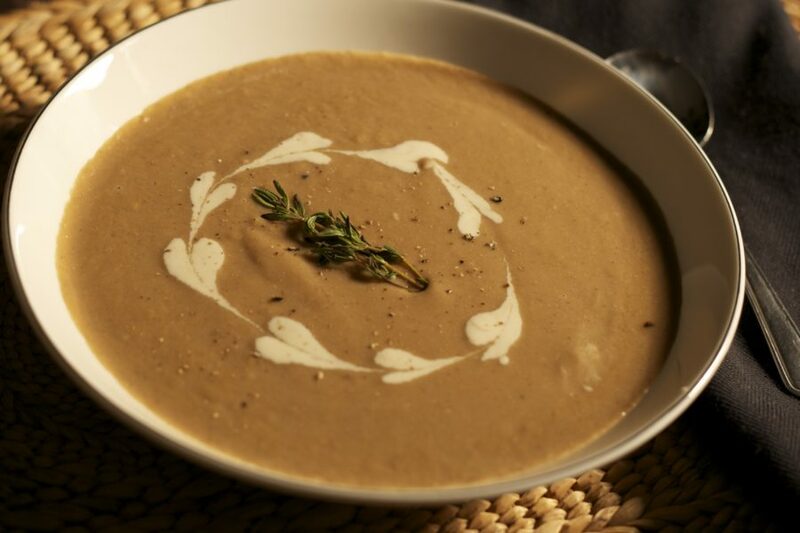 But it’s really tasty- just a super rich, creamy soup….but best of all, it’s dairy-free! Just a potato, and a bit of cashew cream to thicken this silky smooth soup. I used a can of chestnut puree, but I’m sure that you could substitute roasted chestnuts, or canned, peeled, chestnuts. Give it a try, and let me know how it goes! 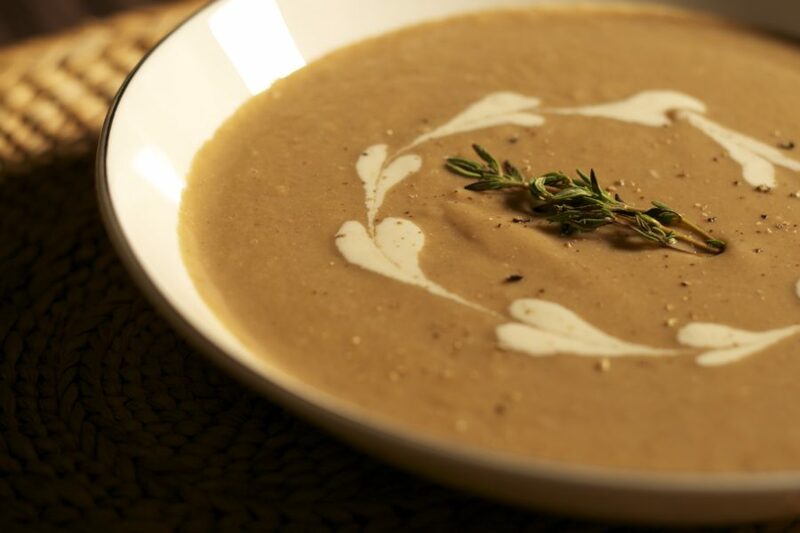 Silky smooth and creamy chestnut soup. Vegan. Prepare cashew cream. In a blender, add cashews and water until smooth. Best done in a Vita-mix or other high-powered blender. Set aside. In a saucepan, heat olive oil. Add onion, garlic, and celery, and cook over medium heat until translucent. Add the bay leaf, nutmeg, salt and pepper, vegetable stock, potato, and chestnut puree. Bring to a boil, and let simmer for 30 minutes. Remove the bay leaf, and process in a blender, until smooth. Stir in cashew cream. Divide into bowls, and garnish with fresh thyme, and cashew cream. Enjoy! I’ve submitted this soup for Keep It Real Thursdays at Beyond The Peel. Check it out! Awesome healthy recipes every Thursday! Tropical Traditions Coconut Oil Giveaway WINNER!